To accept bookings, you need to create a bookable product. Go to: Products > Add New. A familiar WooCommerce interface for product creation appears. Enter a title and description for your product. Scroll down to Product Data and select Bookable Product in the dropdown menu. Tick the Virtual checkbox, if your product does not require shipping. This omits the Shipping Costs tab from your product. Fields will change to reflect bookable products. The first settings are booking duration, calendar display and confirmation preferences. Select the appropriate Tax status and Tax class for this product, should you need to charge tax or not. This determines how long a booking lasts. The duration can be admin defined (fixed block) or customer defined (they need to input on the front-end). Duration units can be Hours, Minutes, Days or Months. Fixed blocks have a set duration that you define. The customer can only choose one block which will last the defined amount of time. For example hair dresser appointment lasts one hour and you can only book one at a time. Customer-defined blocks have a set duration, but the customer can choose how many blocks they want. For example, the co-working space is rented out in hourly intervals, and the customer can define how many 1-hour blocks they would like to rent. A minimum and maximum allowed value can be included in the General tab. This allows for a more flexible starting schedule. It is possible to use 30-minute blocks and set the minimum to 2 blocks. Your customers now need to book at least one hour, and can add increments of 30 minutes. A customer-defined duration with blocks in minutes/hours will display a dropdown. A booking can be set in blocks using minutes, hours, days, weeks, and months. If using hours and minutes, you can specify what time the bookings start. Select Calendar always visible or Display calendar on click. By default the calendar is set to always show. 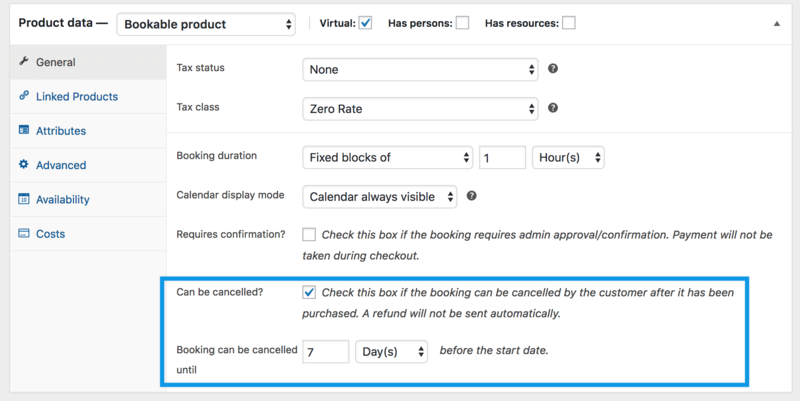 If the Booking duration is set to be Customer defined with a unit of Days, then another option will be shown to enable the calendar range picker. Enabling this allows customers to select a start date and an end date for their booking within the calendar itself. If the booking needs to be reviewed by an Admin before confirmation, tick the Requires confirmation? checkbox. Rather than take payment at checkout, the user inputs details and submits them for approval. To learn more, see Manage Bookings. Bookings requiring approval will remove other items from the cart. They must be checked out alone, so payment gateways can be safely disabled. If the Requires Confirmation checkbox is ticked, only the Check Availability option is shown when checking out. Once the booking is approved, the customer receives another email to then submit payment. You may choose whether you want the user to have the option to cancel their booking. After selecting the option Can be cancelled?, two fields appear that allow you to choose how many Minutes/Hours/Days/Months prior to the start date that customers can cancel a booking. This setting allows multiple bookings at the same time. With a fixed booking of 1 day and maximum bookings per block set to 2, then each day you can accept two bookings. If today is March 1 and you set minimum block bookable to 1 month into the future, then the first date a customer could book would be April 1. The same applies to the maximum date bookable. Based on the unit of time set for the booking (minutes, hours or days), you can specify a period of time after a bookable slot that is unavailable for anyone else to book. For example, if you sell appointments in 1-hour blocks and wish to have a break of 1 hour between them, you can specify a buffer period. If you prefer to add a buffer before and after your appointments, tick the Adjacent Buffering checkbox. This option adds the specified block both before and after each booking. Defining a buffer period of one hour between booking with adjacent buffering will result into 2 hours between bookings. Buffer periods are always defined in the same time measurement (minutes, hours or days) chosen for blocks. If you want to have a 30-minute buffer between your 1-hour appointments, be sure to use 60-minute blocks instead of 1-hour blocks. Depending on how you want to set up availability, this option allows you to set available by default or not available by default. Available by default means all blocks are available and you can specifically turn some off with rules, where not available by default means all blocks are not available and must be turned on through availability rules. All blocks being booked – This checks all available blocks within a duration. 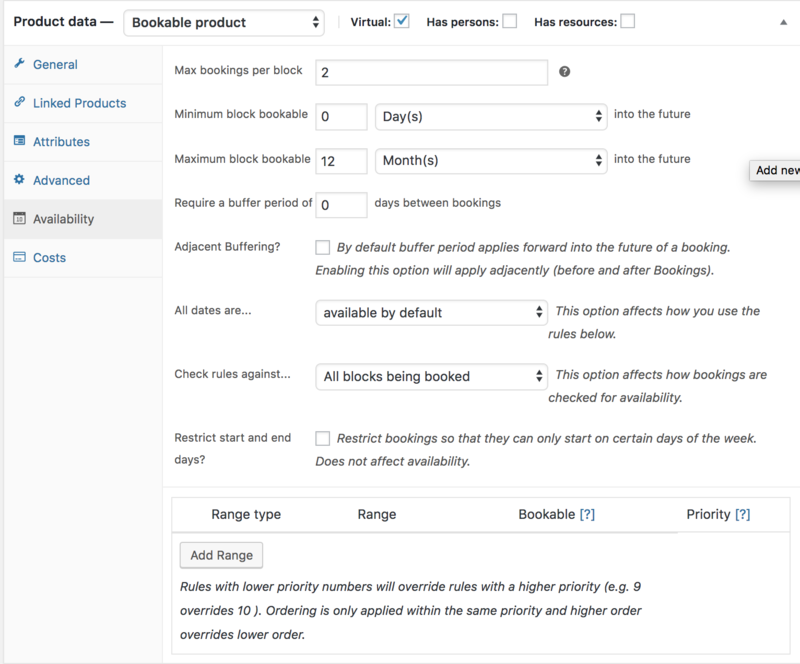 For example if a customer chooses to book for 5 days and 1 block is equal to 1 day, it will check availability for all 5 days. Starting block only – This checks the first block the user selects. For example if a customer chooses to book for 5 days and 1 block is equal to 1 day, it will only check availability for the first day. Say you have a weekly rental, but you only allow customers to start their rental on Fridays. Select the day (in this case Friday), or day(s) you would like to restrict the booking to start on. This does not affect availability; other days are still available, they just cannot be selected as the day(s) that bookings start on. A new row is created, where you can choose a range type, from/to, whether it’s bookable or not (yes or no) and a priority number. Date Range with time – a time range can be set with a start date/time and an end date/time. The range will apply from the start time on the start day until the end time on the end date. Date Range with recurring time – a time range can be set based on a custom date range. The time range will be repeated on each day in the date range. Note that the time ranges are not opening hours, but booking hours. If you offer 1-hour time blocks and your shop is open from 9:00 am to 6:00 pm, your last booking is at 5:00 pm, not 6:00 pm. By default, Global availability rules take priority over product level availability rules and product availability rules take priority over resource priority rules. The order can be changed using the priority numbers. A lower priority, irrespective of context, overrides any other context with higher priority number. For example, a 9 will always override 10, even if 10 is on the Global level. If multiple rows have the same priority, the rules higher on the list will take priority. Rows can be removed by clicking the X on the far right, or dragged and dropped to sort using the handle on the far left. Also be aware that availability options can be set up globally if all bookable products share some dates. To read more about Global availability, see Booking Settings. Costs for specific slots are controlled from the Costs tab. The two main costs you can add are Base cost and Block cost. Base cost is applied regardless of a customer’s choices on the booking form. Block cost is the cost per block that was assigned in the General tab. If a customer books multiple blocks, this cost is multiplied by the number of blocks booked. Persons count – from and to will show number inputs. Block count – from and to will show number inputs. Base cost and Block cost can be added, subtracted, multiplied or divided by the amount you enter. With version 1.10.9 (pending release), you can also directly set the costs applied for the rule. If multiple rows match, all additional costs are used. You can set a min and maximum for persons. 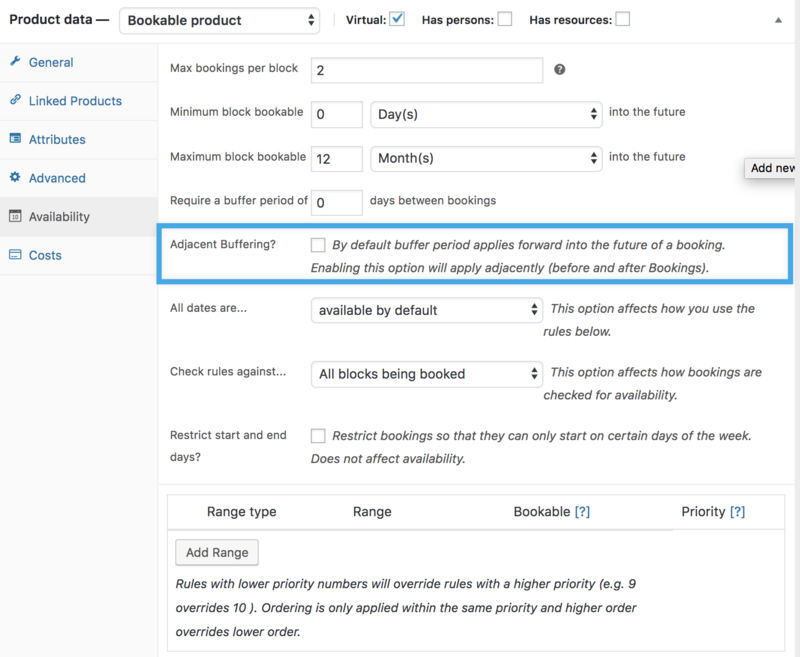 Similar to duration, the customer can input a value on the frontend booking form, if enabled. If multiple costs by person count is enabled, all costs are multiplied by the number of persons the customer defines. If count persons as bookings is enabled, the person count is used as the quantity against the block. Remember the max bookings per block setting above? That determines the upper limit for allowed persons per block. Once the limit is reached, more persons cannot book. Once you tick this checkbox, you have the option to add multiple types. Give your Person type a name and define the cost for the type. Adding a description is optional. You can define a minimum and a maximum number for each person type. For example, you could require at least one adult for each booking while making children optional (minimum 0). If you leave Max blank, there are no other restrictions than those of the bookable product itself. Clicking the Unlink button will remove the person type from the product. The person type will still exist, but be hidden, this is so previously created bookings are not broken. Automatically assigned – A resource is automatically assigned to a customer booking if available. An example use case for a customer selected resource would be a room type, such as single and twin rooms. An example use case for an automatically assigned resource would be a hair salon where the resources are staff and someone is assigned a booking. More at: Hair Salon – Bookings Use Case. After enabling resources, choose your type. If you have chosen Customer selected be sure to give your resource a label. This is what is shown on the frontend booking form. Resources can be used globally across multiple products. For more information, see: Using Resources.